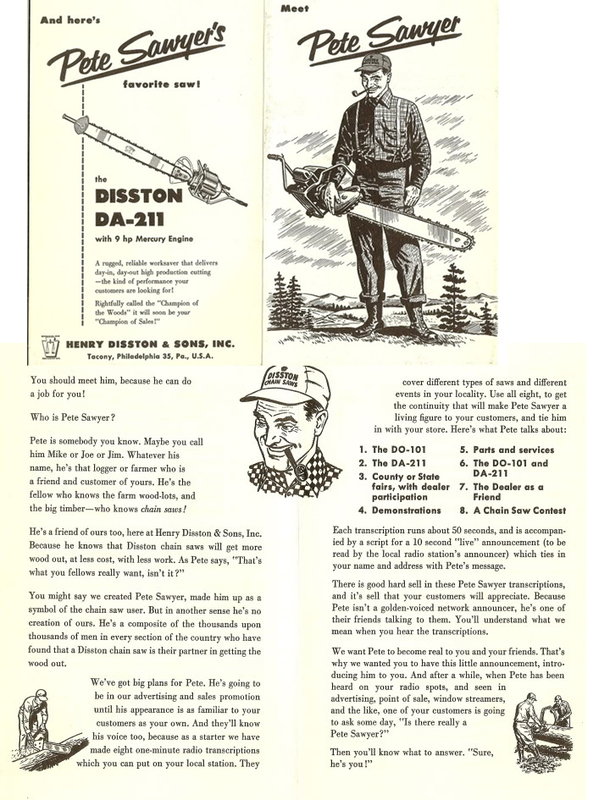 Henry Disston was the best name in saws, and Mercury, made by Kiekaefer of Fond du Lac, WI was a great name in outboard motors. Put the two companies together and the product should be a really great chainsaw. Loggers had a wide range of feelings about this saw. Many felt that it was the best chainsaw ever made. It certainly cut well and fast, and was very trouble free compared to other saws of that time. Its two cylinders smoothed out the motor at all rpms. A Montana store receipt and note from the buyer detail the sale of a saw in 1955 that listed for $700, had been marked down to $399, and sold for $300 with a 30 inch bar and chain. 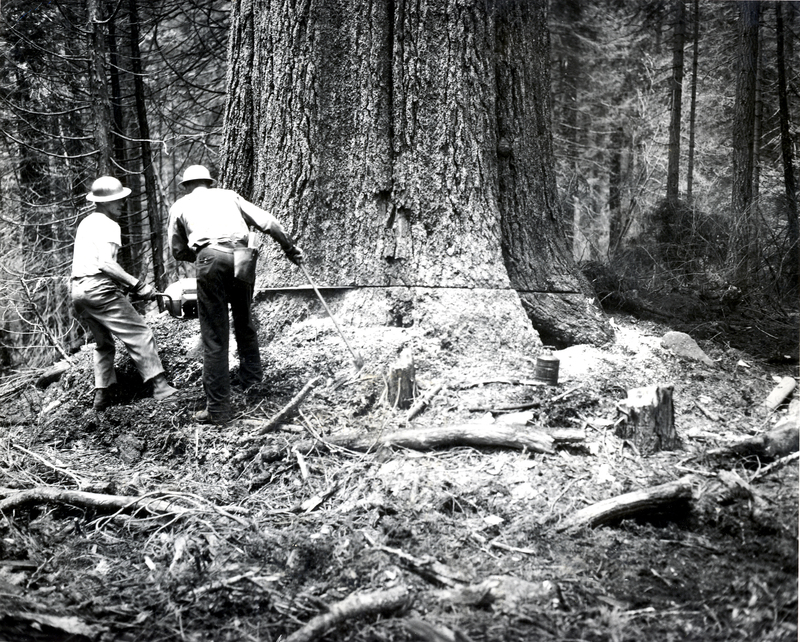 Kiekhaefer and Disston had a falling out and Disston tried to build their own motor for this saw, but it never was a success. Here’s an interesting spec sheet on the saw. Probably only of interest to the mechanically inclined. Great saw, but maybe not as great as the person who put together the spec sheet states at the end. Ah, maybe it was. DISSTON HENRY & SONS INC.
8 oz. to 1 gallon U.S.
Unpainted aluminum body with orange enamel spark plug cover, air filter cover and bar clamp. Undoubtedly the finest Chain Saw engine ever manufactured. These saws would work day after day with little or no trouble. Quiet, powerful and virtually no vibration due to the twin cylinder design. Hello i am looking for a service manual for this saw. Do you know where i could atleast get a copy of one please? No, the best we can offer is the specifications as listed above. They were very helpful to us. Well, it partly depends on what condition it is in, and whether you can find someone who really wants it. Are all the parts there? Does the motor turn over when you pull the starter cable? It seems as if owners of these saws who sell them on e-Bay hope to get up to $150 for them. I would guess that your saw needs a magneto. i have one of these saw as well? what is a magneto? The magneto is the device that generates the spark to fire the spark plug. I remember the man killer saws. They were faster than a cross cut but they were heavy. Can anyone recommend where I may acquire parts com my DA211? what fuel are you currently running in this, and what oil are you mixing it with. Have a customer looking for 72 octane fuel and not sure what oil to put in it. Maybe a couple hundred dollars. 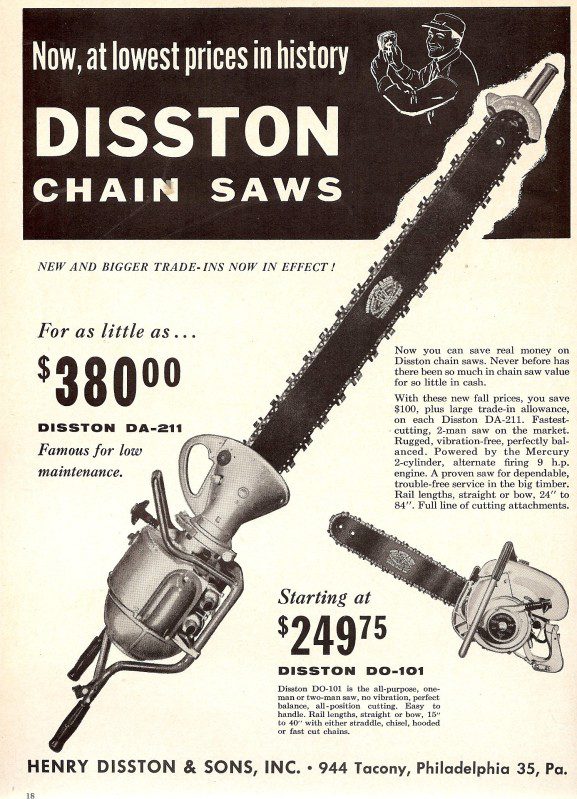 I think Mercury Disston is one of the best chainsaws, but how collect its parts?